A set of custom-made, surface-mounted LED lights have recently been installed in Computrols’ new manufacturing facility in Gretna, LA. At first glance, these lights seem more or less ordinary, but below the surface lies massive potential – the ability to learn. While the concept of adaptive lighting is not exactly revolutionary, the efficiency in which it is employed is rapidly advancing. The lights were conceived and created by Computrols’ own research and development hardware engineer, Thomas Bordenave. The fixtures use COB-type LEDs (that is, Chip On Board) which are essentially multiple LED chips packed tightly together into one lighting module, which draws a fraction of the power normal bulbs pull. The advantage of COB LEDs is a considerable thermal resistance change, higher energy savings, longer bulb life, and noticeably better light distribution from standard LED and incandescent lighting. With consistently low heat generation, these lights will also reduce the cost of cooling the space. The bulb life of these tiny LEDs is also a significant factor, in terms of efficiency. Bulb burnout, assuming the lights were used twenty-four hours a day, seven days a week, would occur at just over five years. Compare that to standard LED lighting, which burns out in just over one year (incandescent and fluorescent lights don’t come anywhere near these time periods). Even then, Mr. Bordenave has designed the lights so that replacing a burnout is actually possible since most COB lights require an entire fixture replacement. With Bordenave’s setup, an engineer would only need to exchange the COB module (LED clusters), reducing long run costs. Mr. Bordenave is currently implementing complex controls for these lights as well. The lights are already dimmable, which is an old energy-saving tactic. What makes these special, though, is the controls that will allow the lights to detect human movement and adjust accordingly. During times when there is little or no activity on the floor, the lights will dim automatically to reflect this change in use. This functionality may have countless future uses, including recording areas where workers congregate most and adjusting to those patterns. They also have the ability to be connected to a wireless network, allowing all lighting controls to be manipulated remotely. While these controls are not currently implemented into the lights, Computrols’ R&D team intends to have them fully integrated in the near future. 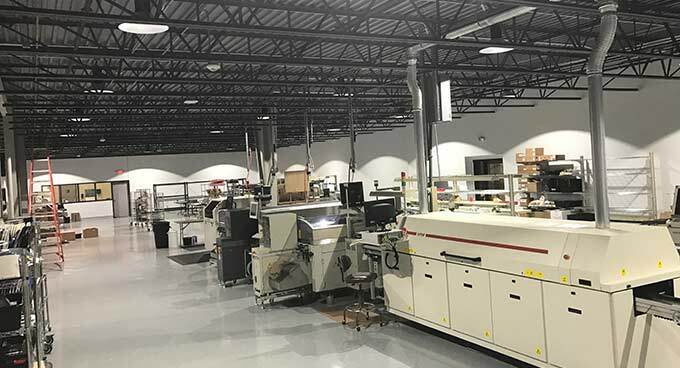 With the recent move to a new, larger facility, the company has gone to great lengths to ensure that the addition reflects the energy efficiency Computrols is known for, and the lighting is no exception.